Billy Tigrett, Prentiss County soybean producer, is restoring his old-fashioned equipment for his modern production operation. And Tigrett absolutely has a purpose—he’s rebuilding the Prentiss County farm where he grew up and where he now lives with his wife, Barbara. He’s not worried that his age will get in his way. For that matter, he doesn’t think the age of the equipment—close to 60 years old—will get in his way, either. He’s also restoring his old tractor—Tigrett actually grew up riding it. While it’s not as comfortable or snazzy as the later models, he takes great pride in renovating it to use for his modern soybean production operation. Tigrett grew up farming soybeans and cotton. After he left the area for college and a teaching career, his dad rented the land out to local farmers. The fields gradually became smaller as they stopped using fences. Ditches grew up with trees. Some old fields with long, straight rows developed six, seven, or even eight short rows. When Tigrett returned to the family farm as a retiree, he bought a backhoe. He was determined to reverse the loss, and his fields are regaining their width. Overall, Tigrett’s 2017 crop yielded impressive results; he grew 50 acres of quality soybeans. He says he feels well on his way to making the improvements necessary to increase his efficiency and his harvest. “I have to leave this land better than I received it,” he emphasizes. When Tigrett grew up farming soybeans and cotton, producers had very few choices in soybean varieties, he says. However, a myriad of choices abound today. 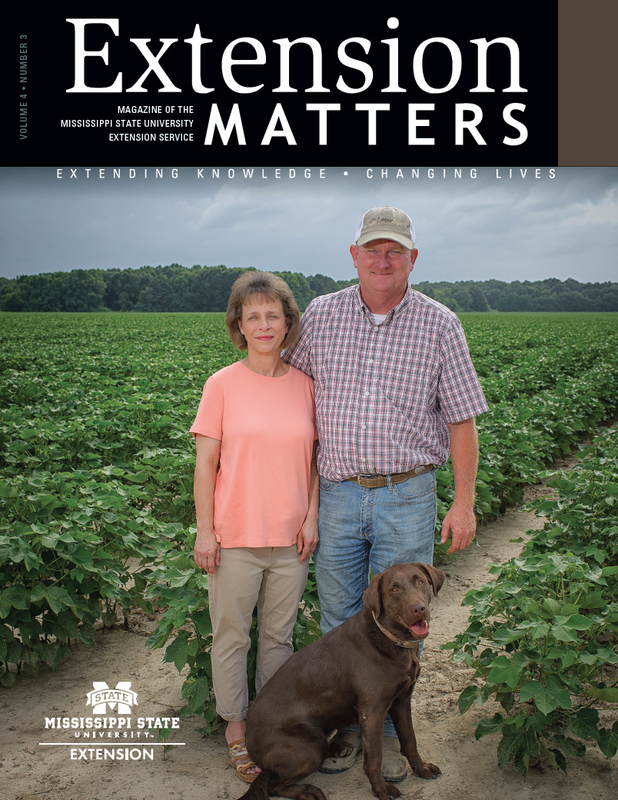 “I quickly realized I needed information, and, being a Mississippi State graduate, I knew I needed the Extension Service,” he says. “Extension goes back a long way with me: I was in 4-H with the assistant county agent Jim Archer, and we went on trips to Club Congress. I did projects in soil judging, in beekeeping, and I still have two hives of bees now. Stokes, the Extension agent in Monroe County, has expertise in soil and row-crop production, and Tigrett says he’s grateful for the assistance he’s received from Stokes and Glidewell. Glidewell is the Extension agent for Prentiss County, and he’s truly a jack-of-all-trades, Tigrett says. Having the help to return his farm to profitability has been very important to Tigrett. Even using old equipment, Tigrett’s application of modern methods has been vetted and explained by Extension agents. “I’m not saying that using old equipment makes it better, but, with it and Extension, I’m finding a good way to do this to see if it’s a profitable thing,” Tigrett explains. “Skip has helped me to put together a lot of connections; he’ll come up with an answer right then and there, or he’ll call somebody.